Cedar Falls Community School District (CFCSD) didn't become an academic and technology leader by rushing to follow trends. 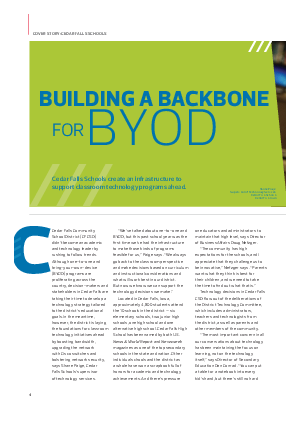 Although one-to-one and bring-your-own-device (BYOD) programs are proliferating across the country, decision-makers and stakeholders in Cedar Falls are taking their time to develop a technology strategy tailored to the district's educational goals. In the meantime, however, the district is laying the foundations for classroom technology initiatives ahead by boosting bandwidth, upgrading the network with Cisco switches and bolstering network security, says Shane Paige, Cedar Falls Schools' supervisor of technology services.